takes some of the most delicious ingredients you will find at your local delicatessen, and packs them into a freshly baked focaccia roll. 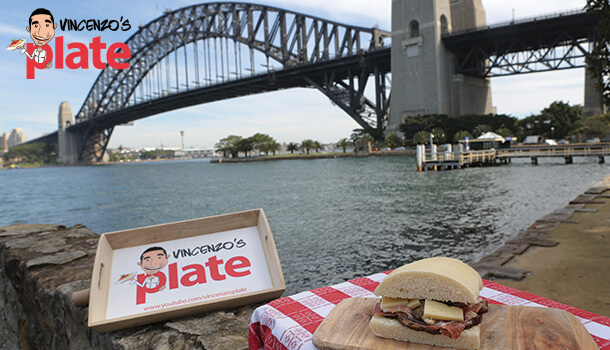 Watch me enjoy this simple favourite, right under the Sydney Harbour Bridge. 1. Cut the focaccia into smaller pieces and then slice each of them in half..ready to be filled! 2. Slice the pieces of cheese into smaller pieces so you can line them up inside the yummy panini! 3. Drizzle extra virgin olive oil over each side of the italian panini and then squash the pieces together so help the oil absorb into the soft dough. 4. Open up the italian panini again with the inside facing up. 5. Layer the 2 x slices of eggplant on the bottom half. 6. Add at least 2 x slices of prosciutto on top. 7. Get a spoonful of marinated mushrooms and put them on the paper towel to get rid of the excess oil, then add them on top. 8. Place as many pieces of cheese as you wish on top, to cover up the rest of the ingredients. 9. Put the other slice of bread on top, and squash it down so that the panino and all its yummy insiides start to stick together. 1. You can wrap up the Italian Panini nice and tight using foil and pack it up for a picnic, or serve portions of it on a chopping board as an antipasto. 2. I like to eat it just like this!! It reminds me of when I was little and my Nonna would always have delicious fresh italian panini waiting for me when I would arrive home from school...I have to say, no one makes them like Nonna....even if they have the same ingredients!!! E ora si mangia, Vincenzo's Plate...Enjoy!